Most audio or video converters require that you download and install the application on your computer so that you may use it effectively. Some software come with additional ads which can be annoying sometimes. 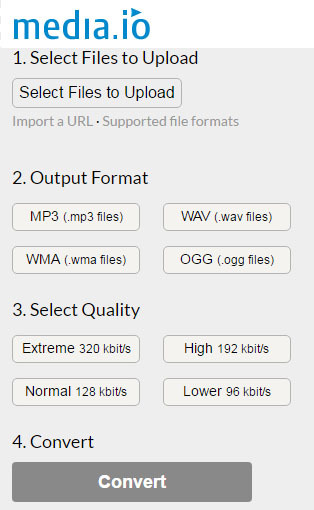 Nonetheless, if you want to convert your WAV to MP3, you can still do it without installing any software. There are free online converters that require you just to upload the file that you want to convert and then the application will do the task for you. Therefore, if you do not want to install any app on your computer, you can use WAV to MP3 online converter services such as the ones discussed in the next part of this article. Apowersoft provides an efficient and easy way to convert audio or video files to your preferred audio format. The web allows you to choose from a variety of file formats including MP3, WAV, AAC, WMA, and OGG. 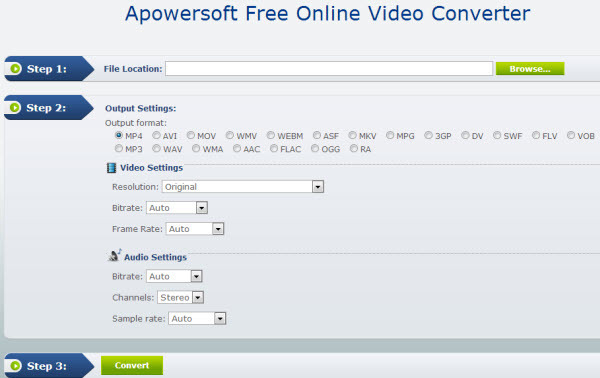 The apowersoft application converts audio and video files in three simple steps. The steps are Uploaded File > Select Output Settings > Convert. It is absolutely a free website service. The service does not need any registration or any sign-up. It supports fast and stable conversion. It may take long to convert larger files. Online Audio Converter is a free online App that converts audio files for you without any installation. Apart from converting audios, it also converts videos to different file formats such as mp3. The tool supports conversion of more than 300 file formats both audio and video formats such as M4A, FLAC, OGG, MP2, AMR, AND M4R. Easy to use. Just upload file, select format & quality, download the output file to your computer. It helps extract audios from videos files. Files are automatically deleted from the server, and no one can access them. The website entails some other adverts which keep popping up. Media.io is an online audio converter website that supports the conversion of files without the need to download software. When using this tool, all you need to do is upload the files, and it will convert them for you. The site has a simple interface which entails the Upload of Files > Output Format > Select Quality > Convert. It has an amazing upload and downloads speeds. It supports more than 150 audios and videos file formats. It is 80X faster than any online converter. It has unlimited YouTube downloading and conversion. It requires a stronger internet connection. Zamzar is an all-inclusive file converter. The converter lets you upload your file for conversion.it also supports the download of online videos for conversion you just need to ensure that you copy past the URL of the audio or video you want to convert. Zamzar supports a large number of audio and video formats, and you can convert to as many formats as you desire. It has a simple and straightforward interface. It supports direct download of videos using their URL. It does not support files exceeding 100MB. The process of conversion is slower compared to desktop software. Online convert has other 10 converters which are listed on the website. The type of converter you choose depends on what you are converting. However, the program supports conversion of 32 file formats both video and audios. You can customize the audio quality, screen size frame rate, and other settings during the conversion. You have to register and login to enjoy the services. iSkysoft Video Converter Ultimate is a powerful audio and video converter. The application converts files in batch and at an incredible speed. It is the best tool that can be recommended for the conversion of WAV to MP3 because it will convert the files without inferring with the original quality of the file. iSkysoft Video Converter Ultimate is an all in one app to convert, burn, edit, download and play videos. Download videos from online sites such as YouTube, Vevo, Vimeo, Hulu and other more 1000+ streaming websites and convert them into your preferred formats. Convert files in 90X faster sped without causing any quality loss of the original file. 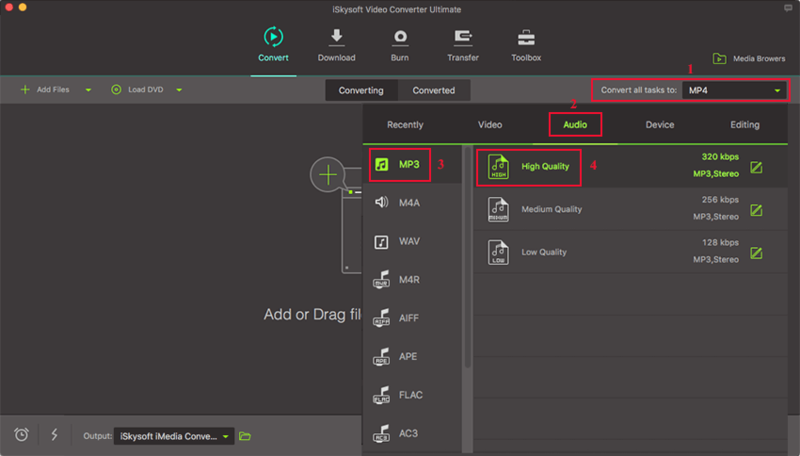 If you want to learn how iSkysoft Video Converter Ultimate converts WAV to MP3, you can watch the video below to get a quick overview when free.